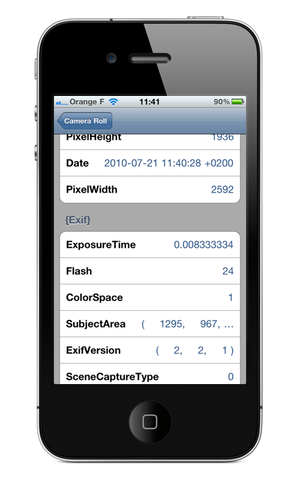 Exif & IPTC Metadata Browser is a bare minimum metadata browser for your iOS4 iPhone. Read all the metadata types in your pictures when they are available. For example read exif data from your camera roll. Or IPTC tags from imported pictures taken on the web. With version 2.0 for iOS 8, this app is also an extension for your Photos App. See your metadata directly on a picture in your photo roll by enabling the extension. NB: there used to be a bug in iTunes that caused the app to strip metadata when importing pictures to your iPhone/iPad. It's gone, but if you have that problem, make sure you delete the "iPod cache" folder so that iTunes optimizes your pictures again. Check the other apps Meta Editor for iPad and PhotoLocations if you'd like to support me, and want more tools like this. Ah, yes, it is on the AppStore.